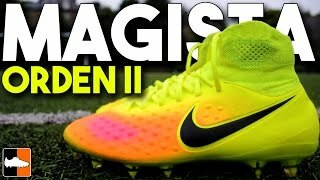 The 3rd tier boot in the Magista range is the Magista Orden II. 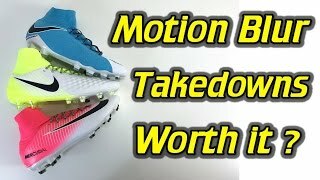 With a starting price of around £145, this mid-tier boot is a great alternative to the elite Magista options of the Opus and Obra boots. Well, you could say the Orden II takes inspiration from the both the Obra II and the Opus II as Nike have including the Dynamic Fit Collar seen on the Obra II. However, the Orden II has a textured synthetic leather upper which provides better control for players and has adopted the dimples on upper similar to the Opus II. The Orden II has also continued the tongueless style which can be seen on both the Obra II and the Opus II. 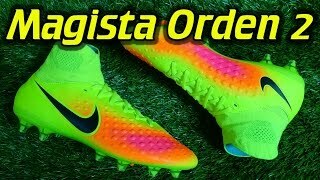 However, this soleplate adds a great deal of support and stability for the player and is an improvement on the first edition of the Magista Orden.